· Outlook unable to access data from corrupt PST file. · Outlook stopes synchronize mailboxes with Exchange Server and offline data. 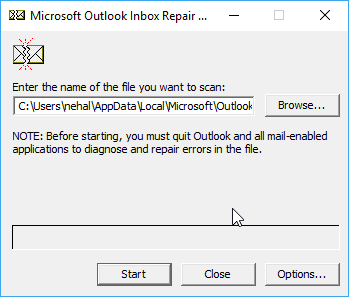 · Outlook crashes and stops responding when trying to access data from the corrupt OST file. These crashes are caused by different corruption in Outlook offline data file (.OST file) or personal storage table (.PST file). 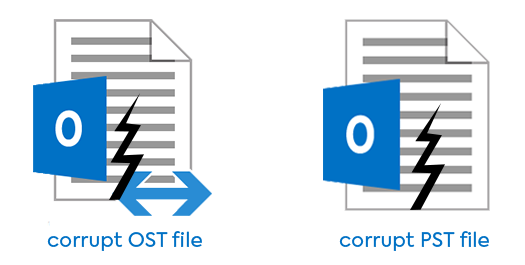 The reasons of corruption in OST file are many be virus or malware infections, network or disk failures or synchronization issues or PST file usually got corrupted when you try to export mailboxes to a PST file using manual methods in Outlook like Import/Export Wizard or Archive method. 1. Repair corrupt OST or PST file using inbuilt Microsoft Outlook Inbox Repair Tool. 2. Using a third-party OST or PST recovery tool. 2. Brose Outlook installation folder and find the SCANPST.exe tool. 4. In Inbox Repair Tool browse and select corrupt OST or PST file. 5. Click on Start to scan the error with Outlook data files. 6. Here you can see the information reported in the Inbox Repair Tool after scanning the file. 7. Click on Repair to start repairing process of corrupt Outlook data file. 8. After repair complete click Ok.
§ Inbox Repair Tool is unable to repair very large size of mailboxes data. § SCANPST.exe utility is unable to repair deleted items. § This tool is not capable to handle major corruption issues is OST file. § It is not capable to repair password protected PST files. § Risk of data loss during the repair process. a. OST file- To repair and recover corrupt OST file a third-party OST Recovery tool is helpful. This tool can easily repair any type of corruption in OST file and recover all emails, contacts, calendar etc. without losing any data. This software also provides you with an option to export recovered data to a healthy PST file because OST file is can directly importable in Outlook. You can easily import this PST file in Outlook to get back all your data and this will fix crashes in Outlook. b. PST file- If you have a corrupt PST file and Inbox Repair Tool fails to repair it then, you can use third-party Outlook PST Repair Tool. With the help of this software, you can easily repair PST file and get back lost data and then any crashes in Outlook is fixed.